Wherever you go or stay in the world, there’s one staple that’s likely to be part of your everyday diet. And if you love bread as much as I do, you’ll probably go for a few helpings a day. Well yes, I can’t imagine my breakfast without a good slice of buttered bread lavishly topped with radishes and lettuce. More often than not, I’ll have another one with my afternoon snack. Or better still, I’ll replace it with a wholegrain bun or a small baguette. And if I’m a bit peckish before going to bed, a smidgen of bread will always do the trick. When it comes to bread, Slovaks are discerning customers who want their loaf to be plump and airy with a light, porous texture – which indicates fully fledged fermentation – and a shiny golden crust. A traditional Slovak loaf will have an oval shape and weigh 1 kg (2.2 lb), although smaller loaves are becoming increasingly popular. Given the size of the country and its population (5,4 mil. ), we have a very dense network of bakeries, which means the competition is really high and so is the variety of breads. Slovaks tend to favour small producers, who bring more personalized touch to their bread, as well as exciting subtlety of flavours. When touring my native region of Podpoľanie (pronounced as Podpolyanyie) a couple of weeks ago, I went to see two bakeries, whose owners were kind enough to show me their premises, and let me take a few pictures of their bread. Those above and in the gallery below are from the Vidlička & Son Bakery, a family-run business specializing in wheat-rye bread, rolls and fine pastries. The family use their own formula and a very specific method of preparing the dough, which allows plenty of time for the dough to rise. A place where the school’s blackboard was once hanging. The father and the son told me their story of building a thriving, modern business from the old, dysfunctional community school. All with their own hands and the help of the family. The visit to Hriňová Bakery brought back the memories from my formative years, when I worked in a large state-run bakery during my summer holidays. As a secondary school student I was exposed to a highly automated large- scale production, which was very effective but lacking that elusive personal quality. I still remember the giant hall with long production lines, kneading machines, and huge ovens spitting out hot loaves. 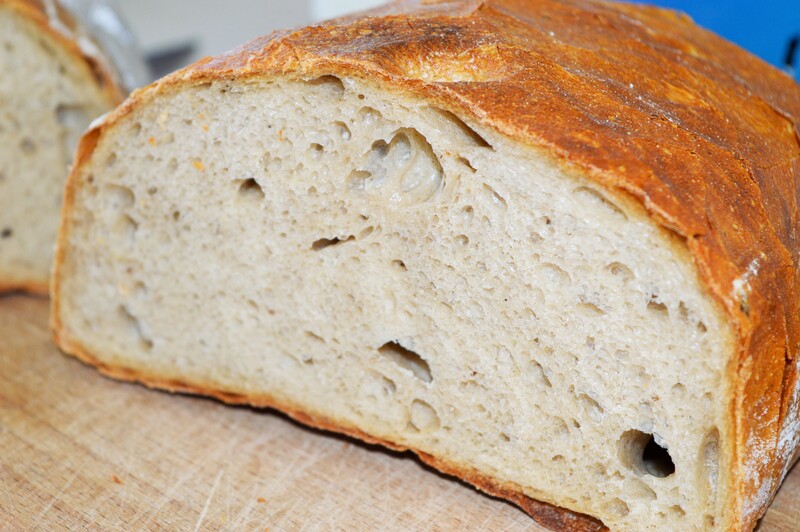 It was the time when I learnt to appreciate the sweat that goes into making a good, honest loaf. The Hriňová Bakery had a completely different feel, though the temperatures ran high inside as well. This is a small, regional business that has been in operation for over 15 years. The company, which initially had six employees, has grown in size as the demand for their products has rocketed. Today they’re regular suppliers for most hotels and tourists resorts in the area, as well as two supermarket chains. The owner and manager, who now employs 40 people altogether, let me have a look at the whole process starting from the dough preparation through kneading and fermentation to the loaf shaping and actual baking. He was generous with detailed information on each stage, and I could see bread was both his life and never-ending love affair. The three bakers who had the morning shift were quiet and apprehensive at first, but as soon as they understood I’d come to shoot the bread not the people, they became more relaxed and the work came easier from under their hands. I recalled someone from the industry telling me that bakers, in general, are solitary night creatures who shy away from the camera light. Anyway, I couldn’t help but admire their nimble hands and bend my head in respect for their hard work. As the bakers were loading the expanded loaves into the oven, the manager explained they’re using the latest technology that closely copies the traditional production, which means all their products are kneaded and shaped by hand. When the freshly baked loaves came out of the oven, the owner singled one out. After it had cooled down, he cut it in halves and nodded with approval. He was happy with the batch and I was allowed to take a shot. This bakery’s bread was more complex in texture and darker in colour than that from the Vidlička & Son, because of the higher proportion of rye flour. Except for mashed potato that is present in quite a few Slovak breads, there was this extra ingredient added during the baking process – the love and passion for the job. As with Detvian strudel, the wheat-rye bread from the Hriňová Bakery was awarded the ‘Regional Product of Podpolanie’ Certificate. Apart from the various breads, the bakery also makes a wide range of fine pastries, steamed dumplings and other yeast-leavened products. Hopefully I’ve been able to enlighten you, my dear reader, on the importance of bread for my people. You may also understand the message behind the long Slovak tradition of welcoming our valued guests with bread and salt. It’s not only a sign of our unstinting hospitality.